After a long flight we arrived in Siem Riep, until the 16th century the capital of Cambodia. This area is home to some of the most famous temples in Southeast Asia, with Angkor Wat being the best known. It is also the world’s largest religious site. The Angkor Archeological Park includes many other temples and covers more than 400 square miles. On the way to our hotel our guide gave us a summary of Cambodian history and the Khmer empire, which thrived from the 9th to 15th centuries and at its height stretched from Myanmar to Vietnam. Although many of the temples were built when Cambodia was Hindu, the religion changed to Buddhism in 1181 and some of the Hindu carvings were altered to be more Buddhist–for example, by adding a third eye to a deity’s face. We stayed at the Raffles Grand Hotel d’Angkor, built in French Colonial style c. 1929-1933. Although the exterior is spare, pool area is spectacular! The elevator is the original one! The next day we toured three temple sites, beginning with Angkor Wat. Somehow we got separated from the main groups (thought no fault of our own) and ended up with a guide for just four of us! It worked out really well, because we moved at our own pace. While we were waiting for a guide, we watched the monkeys at play and took pictures of the iconic facade. Surrounded by a moat, Angkor Wat has three floors. The lowest is for everyone; the second, for meditation; and the third is the called the Nirvana of Paradise and was reserved for the elite. It is an immense structure with multiple buildings and courtyards. We entered through the eastern gate, which was less crowded, and walked west. Fortunately we visited Angkor Wat early in the day, when it was cooler and less crowded overall. The site gets millions of visitors every year, and Siem Riep is full of hotels and businesses catering to the tourist trade. We could see them pouring in as we walked through. 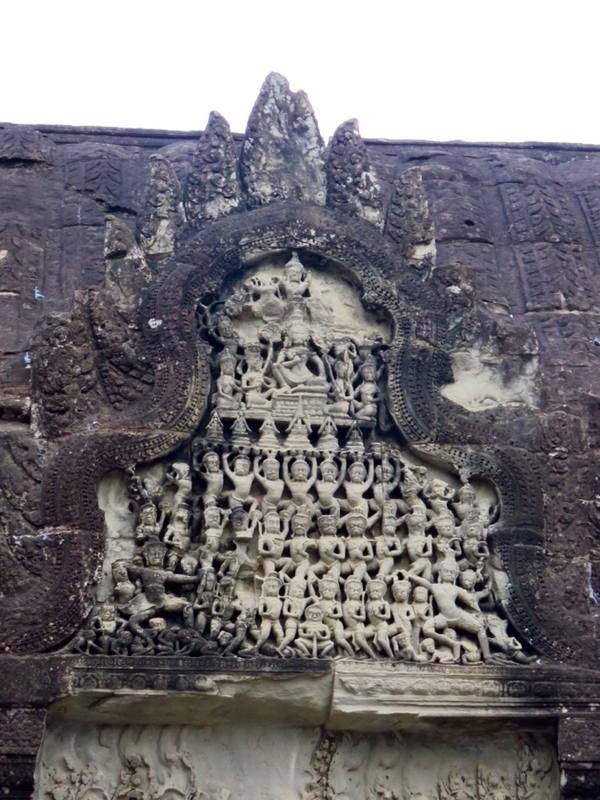 On the first level are many carvings of Apsara, Heavenly Dancers. The more than 1500 dancing virgins sport 56 different hairstyles. I decided to add one more to the collection. I caught this scene on the first level of Buddhist monks talking to a visitor. Note the big soft drink bottle next to the monk in the middle. For some reason I thought the building was reddish, but in fact it’s very dark. Here is an example of the carvings you can see. On the first floor the frieze depicts the Ramayana mythology and the battle of Sri Lanka. Don’t ask me which is which! Here we can see monkey warriors who rescued the king’s wife and brought her back to him. I’m guessing that’s the Ramayana myth. And here are more Apsaras; I found them especially enchanting! This is one of the library buildings, viewed through a colonnade. We only reached the second level–no Nirvana for us!–because the wait was extremely long. Even the group that went very early didn’t do the climb up the narrow steps, because they hadn’t opened the third floor. The view from the top is supposed to be spectacular; ironically, the last group to visit AW was able to reach it, after a 45 minute wait. The seven-headed snake motif is a common one at AW. I can’t recall what it means, however!